There are days when it really pays off to be a top-ranking music journalist. An anonymous source just sent me this photo of Jack and Meg White of the White Stripes when they were kids. You can tell from this picture that the brother and sister have always been close. This is a great photo, full of detail, like how their parents, Red and Chyna, posed the three of them in order of priority. 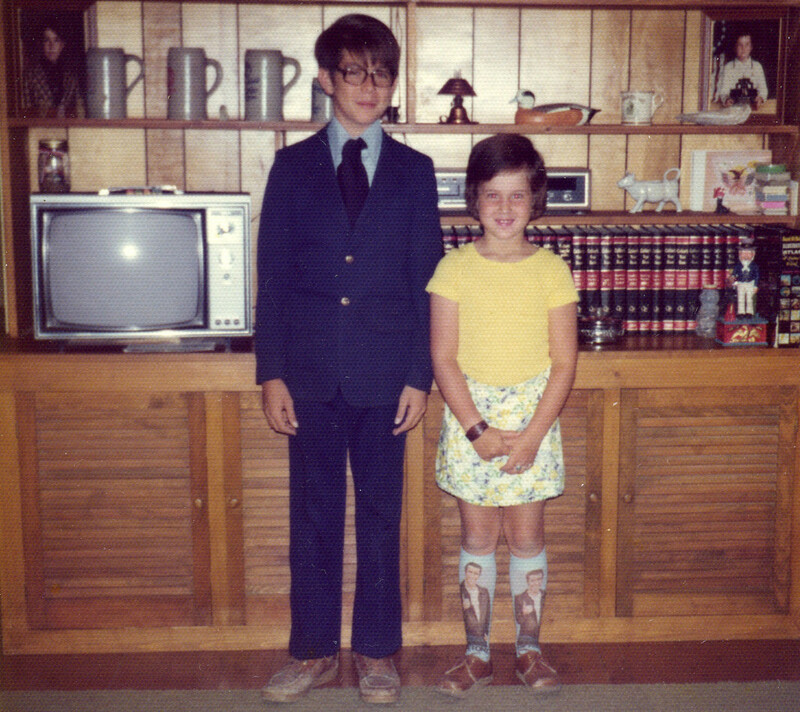 Note the Fonzie socks on little Meg. She was clearly ahead of her time, and a bit of a rebel, with that skull ring. If you zoom in on the leather bracelet she’s wearing, you’ll see it says “OZZY.” A little girl who would wear Fonzie socks and a skull ring and some leather would clearly later decide to be a drummer, because most girls don’t want to be drummers. Most drummers don’t want to be drummers, in point of fact, but someone has to take the ugly groupie. Jack looks super-nerdy here; you can see how that urban myth about how he played geeky Paul on The Wonder Years got started. I’ve been trying to write this for more than a week. I wanted to pick one song, one radio single, that epitomized the aughts or the naughts or whatever the last decade was called. It was tougher than I thought. I have chosen Seven Nation Army, by the White Stripes. There are many songs I liked more than this one. There are songs you liked more, too. Your favourite single of the last decade might be something from Outkast, or Beyonce, or Nickelback, or Lil’ Wayne. My favourite radio-played song of that decade is Rise, by The Cult, but you know me — I like big bad hair. What I was after here is a song — a single released for radio — that sums up that 10-year span the way Smells Like Teen Spirit nailed the 90s. So I prowled iTunes and listened and thought and finally picked Seven Nation Army. Perhaps this is because I first heard it on the radio in the summer of 2003, while driving with my family into an isolated hamlet called Willisville, near Manitoulin Island. We wanted to climb the white LaCloche mountains, and as we pulled our minivan into a spot, this song came on the radio. No announcement, no preamble, just this strange, freaky tune, the likes of which was rarely played on Northern Ontario radio. It was the right song for a magical moment in a mystical place. The next day, I learned it was the White Stripes; I had two of their previous albums, so when Elephant came out I grabbed it right away. Seven Nation Army is a strange, strange song, and it had no business on Canadian radio in 2003. Guitar, drums, vocals, with a classic Jack White vocal performance, a weird cadence, a rhythm from the bottom of a Louisiana steamer trunk and a twist of pain, this is exactly where music was that year, and exactly where it wasn’t. It’s like the Whites took all the parts nobody liked from modern music, put them together, and made them work, while wearing matching outfits. On paper, it’s a terrible idea. On the air, it was brilliant. Odd coincidences: Seven Nation Army was named for singer/guitarist Jack White’s mis-hearing of “Salvation Army” as a child. When I was a kid, I mis-heard Manitoulin Island as “Man Go To An Island.” Also, the supposed bassline of the single is actually a distorted acoustic guitar; this is how we did bass in our blues-rap band in the 1980s. I plan to talk to Jack about this when we get together for coffee. When I stumbled upon Seven Nation Army last night on my iTunes, I realized I hadn’t heard it in a couple of years. I don’t listen to it anymore. But when I did, I loved it … for a while. Twenty years from now, when I hear it played on an oldies station, I will remember that summer, and I’ll smile. That’s the nature of a good single.